The new 2014 Noah movie makes man God and redeems fallen angels. Hollywood again mutilates the Bible, but it was a heck-of-a-show. 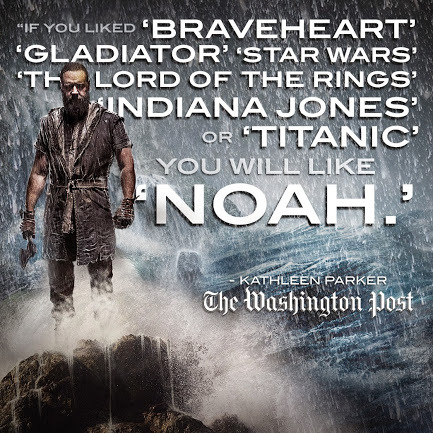 This is my review of Noah, which I saw last night with a few friends. Noah was a captivating movie, complete with fantastic Hollywood special effects and, well, some truth. The writers and producers combined the Biblical account with a modified version of content from the book of Enoch. If you’re confused you should be; let me explain. The book of Enoch nearly made it into the Biblical cannon, having been used by the first century church, but was rejected because the cannon-izers thought it was too ‘out there’ spiritually. It described a group of angels, called “Watchers” (a term the Bible also uses of angels) who cohabited with human women to produce a race of giants. In the Noah movie, the “Watchers” claim they saw man fall and tried to help mankind, invoking God’s judgement upon them. They say God then cast them to the earth and they became these ‘giants’ with a physical makeup of rocks. Pure Hollywood at it’s finest — or should I say in its most imaginative vein? Regardless, in the movie, fallen angels are the result of good angels trying to help fallen man, which is a complete lie. As the movie progresses, these fallen Watchers help Noah and redeem themselves in the process. I haven’t read anything like that in the Bible, have you? The other major discrepancy I see is that in the movie, Noah decides that even he and his family are evil and are not worthy of being saved. It’s Noah’s opinion that all mankind should die including his own and that his responsibility was to save the animals and birds that God sent to the ark. After it landed, they would themselves die and creation would be left intact, perfect, without man to mess it up. Noah is given the choice (in the movie) whether mankind should be allowed to repopulate the earth or not. Does this not put man in the position of God — deciding whether mankind will live or become extinct? But this is typical of current thought and teaching in spiritist religions. As a whole, I enjoyed the movie because I can see truth from error, thanks to God and His Word. I also like fancy Hollywood special effects and watching talented actors like those who played out this one. But why on God’s earth is it so hard – and so rare – for Hollywood to actually produce a factual Biblical movie? Do we feel we have to dress it up to make it more exciting? My review based on truth is probably around 2-3 on a 10 point scale. But in terms of entertainment, I’d put it up at a 7 or 8. Would I recommend it to a friend? You might be surprised that I’d say yes, but I’d warn the friend that it’s mostly fabrication and not fact. Tell me what you think about the new Noah movie!